It is a pleasure to be here with you tonight, celebrating the national day of Australia – one of the world’s most beautiful, and blessed, countries. It is certainly off to a fine start. For that, my thanks to Kristian (concert pianist Kristian Chong) and Sally (singer Sally Marett) for their amazing performance just now. Hong Kong and Australia have long been good friends – in the pursuit of business, innovation, as well as good wine. In the past couple of years, quite a number of my ministerial colleagues visited Australia. I am pleased to note that their talks with the Australian ministers included discussion of a comprehensive avoidance of double taxation agreement. I hope negotiations on that can begin soon. This is because throwing open our respective doors via double taxation avoidance and free trade agreements can only mean expanded trade, more business and investment, and ramped up opportunities for innovation on both sides. We also brought up the possibility of an Australian-Hong Kong free trade agreement, as free trade is one of our common aspirations. These two agreements would definitely make the best of business sense for all concerned. After all, Hong Kong is Australia’s sixth-largest trading partner in services and sixth-largest foreign investor. And our investment in Australia runs from infrastructure and telecommunications to banking, property development, transport, hospitality, agriculture and much more. And you need only glance at the numbers to see how broadly based, how deeply entrenched, Australian business is here in Hong Kong. At last count, around 550 Australian companies called Hong Kong home. In addition, over a thousand Australian companies keep their representative offices in Hong Kong. And, no surprise here: the Australian Chamber of Commerce in Hong Kong is the biggest anywhere beyond Australia, and the second-largest chamber in Hong Kong. From banking and finance, to construction, transport, food, beverage, and more, Australian business believes in Hong Kong's advantages: an efficient and free market, the rule of law together with robust intellectual property protection, a low and simple tax system, as well as a level playing field for business. 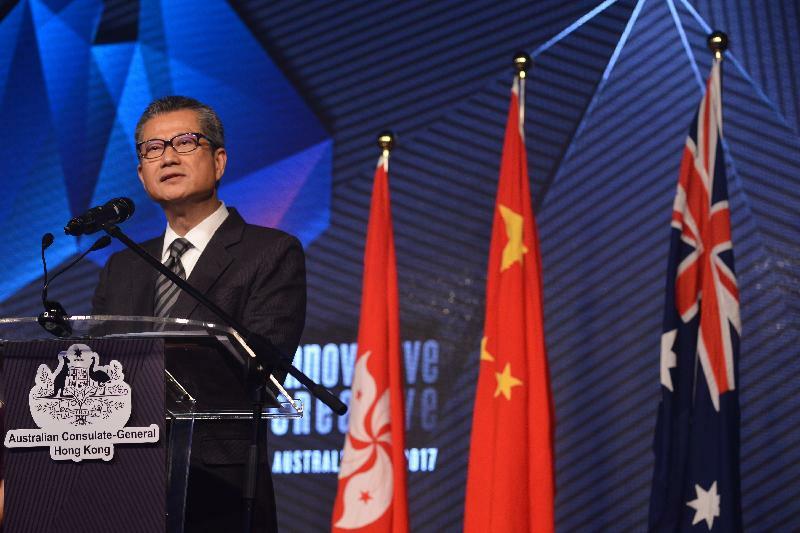 Like most international companies, Australian enterprises also count on Hong Kong’s unique role as the gateway to Asia and the super-connector to the vast consumer markets on the Mainland of China. Innovation and technology development, which is high on the Hong Kong Government’s policy agenda, is certainly an area that we can further cooperate and learn from each other’s experience. Just 14 months ago, we set up the Innovation and Technology Bureau in our Government to oversee the planning and development of our I&T sector. Last year, we injected some US$2.3 billion to fuel the development of the industry. These funds are being distributed to our world-class universities for them to undertake midstream R&D, and to boost the commercialisation of their solid R&D output. Some other funds are being provided to support SMEs to adopt technology services and solutions. And we will be setting up a US$250 million Innovation and Technology Venture Fund, for investing, together with private venture capital funds, in promising local I&T start-ups. 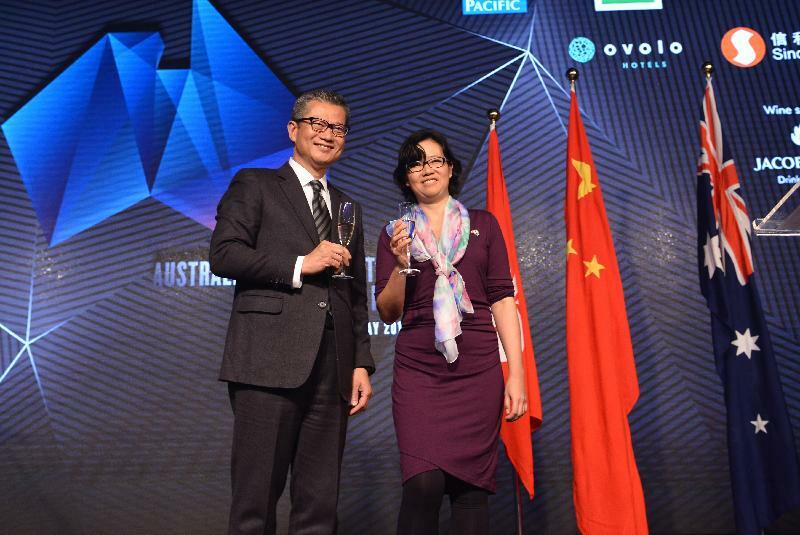 Australia, I’m pleased to note, is very much part of Hong Kong’s I&T future. Most recently, Australian telecommunications company Superloop has completed the first phase in the construction of its dark fibre network in Hong Kong , strengthening our already strong ICT infrastructure. The Hong Kong network is the company’s largest installation to date. A smart move, I would say. As one of the world’s leading financial centres, and China’s international financial capital, Hong Kong is also growing apace as a Fintech hub. Indeed, we newly established the Fintech Facilitation Office under the Hong Kong Monetary Authority to fast-track development of financial technology. Our Fintech office, I am sure, is working closely with the Innovation Lab established by the Commonwealth Bank of Australia last year right here in Hong Kong, which is the first of the bank’s offshore lab. And, finally, if you are a wine lover like me, you will be excited to know that Hong Kong is indeed Australia's fifth-largest wine-export destination in value. And among the world's biggest consumers of Australian wine on a per capita basis. Since we decided to do away with the wine duty back in 2008, Hong Kong has become a wine free-port, as well as the region’s wine-trading and distribution hub. Add it up, and you can well understand why Langton’s, one of the leading wine auction houses in Australia, opened its East Asia office here in Hong Kong last July, extending its brokerage business into the heart of Asia's wine country. And that sounds to me a perfect reason for a toast. So Acting Consul-General, ladies and gentlemen, may I propose a toast to the people of the Commonwealth of Australia.